Those residing in India must have surely heard about Paytm, the popular mobile payments platform. 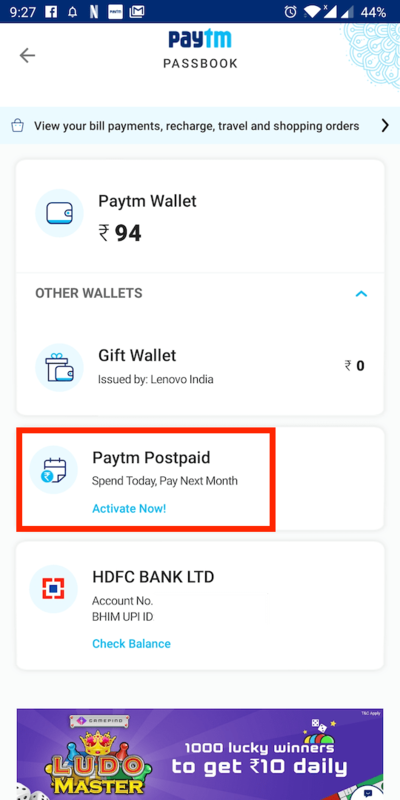 Back in January 2019, Paytm introduced “Paytm Postpaid” that offers its users the facility to buy today and pay next month for the purchases. Paytm Postpaid service is similar to a credit card that works hassle-free without requiring a card, bank details or OTP. The users don’t have to pay interest as long as they pay the bill by the due date. 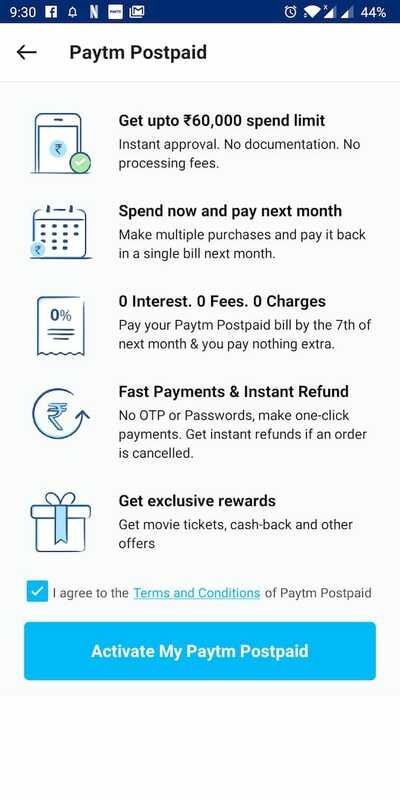 Paytm postpaid can be used to pay for mobile and DTH recharges, booking movie tickets, travel booking and online shopping. Paytm has partnered with ICICI Bank to offer credit limit to its customers through the Paytm app. As of now, the company is offering up to Rs. 60,000 as spend limit. The limit can vary significantly from person to person and is based on your Paytm transaction history. The approval process is however instant provided you’ve already added your personal details including your Aadhaar number and PAN in Paytm. Setting up Paytm Postpaid is quick and easy with no documentation or processing fees involved. One can activate it in a few taps and start making transactions at zero interest and without any additional cost. In this article, we will guide you about setting up Paytm postpaid and making payments with it. Let’s first find out how to activate the service in your Paytm account. Note: Unlike before, you now don’t need to have ICICI Bank account nor have it linked to Paytm in order to use the Postpaid service. In our case, we already had an HDFC bank account added to Paytm. 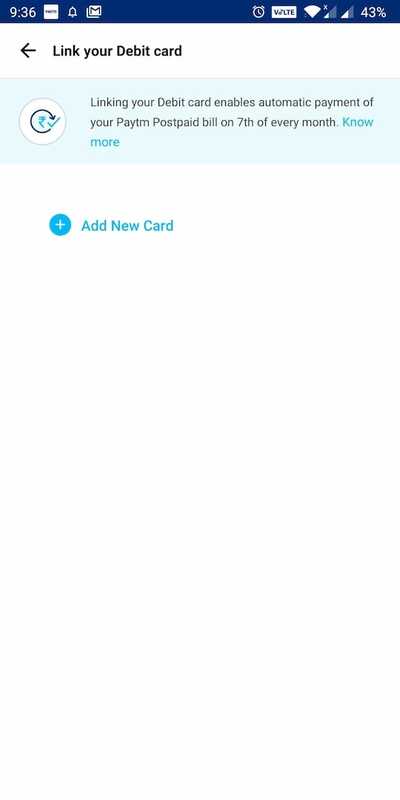 Open Paytm app and look for Paytm Postpaid option in “What’s New” section or at the top. Alternatively, you can find it under Paytm Passbook. 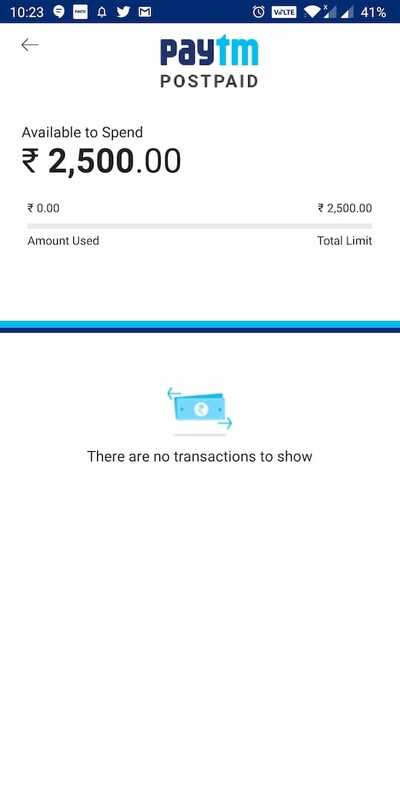 Tap on “Paytm Postpaid”, accept terms & conditions and select “Activate My Paytm Postpaid”. Enter your Aadhaar and PAN card details if required. 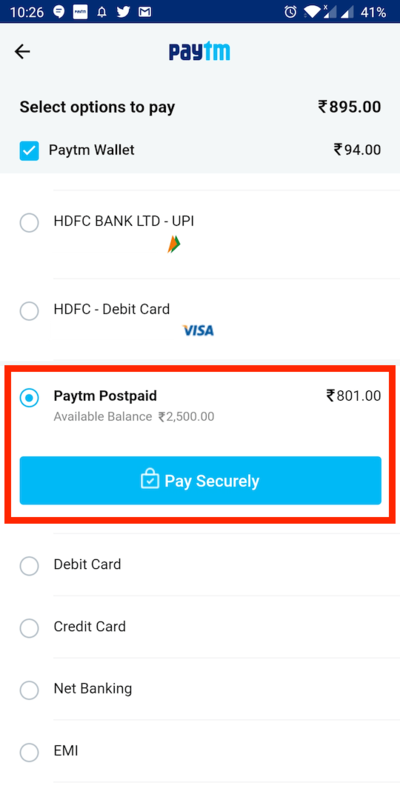 Your postpaid account should get activated and Paytm will show your spend or credit limit. 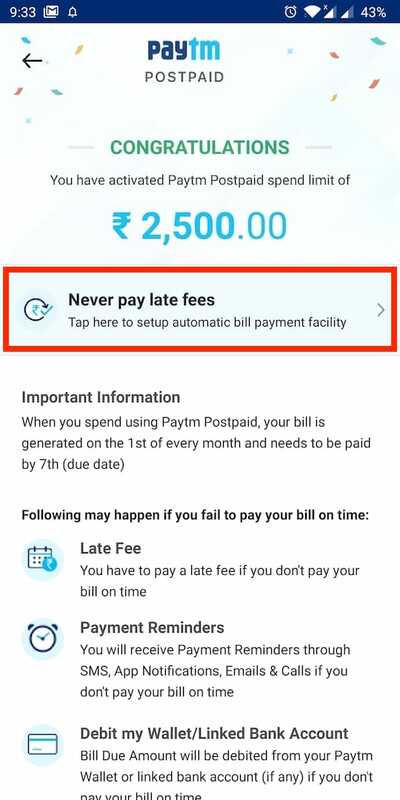 (Optional) On the same page, you can select the “Never pay late fees” option to link your debit card, thus to enable automatic payment of your Paytm Postpaid bill. 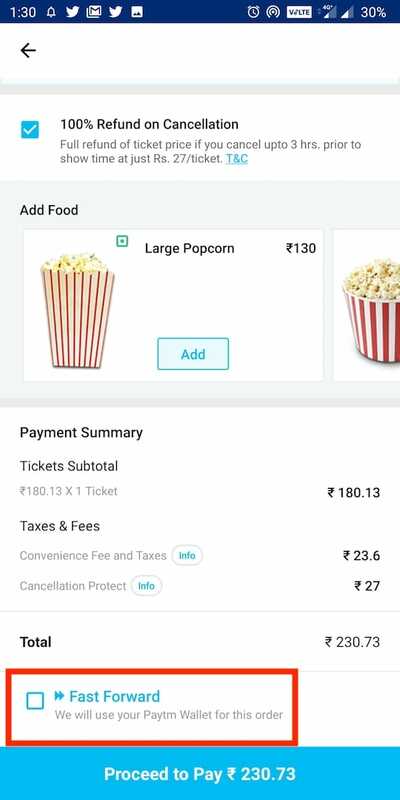 To pay a bill, book movie tickets or buy a product using Paytm Postpaid, simply shop and proceed to pay as you normally do while using Paytm. Note: Make sure the “Fast Forward” option is unchecked to avoid instant payment from your Paytm wallet. While you’re on the payment page choose the “Paytm Postpaid” payment option and pay securely. That’s it! You will be able to make one-click payment without requiring an OTP or password. The payment page will also display the available balance in your postpaid account. Additionally, you can check your postpaid balance through Passbook. To pay the due amount, open your Passbook and select the ‘Pay Now’ button in the Paytm Postpaid section. The bill can be paid using Paytm Wallet, Debit Card, or Net Banking. The bill has to be paid by due date i.e. 7th of the month to avoid late fee charges. The eligibility for Paytm’s Postpaid is decided on bases of your transaction history with Paytm and ICICI Bank policies. Paytm Postpaid account will be blocked and applicable charges will be levied if you fail to pay your dues. The credit limit is based on parameters such as transaction history on Paytm, user’s credit history and ICICI Bank’s internal policies. The credit limit will be increased based on your usage of Paytm Postpaid. In case you’ve any queries then you can share them with us below.